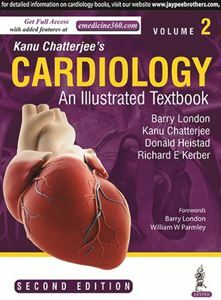 The second edition of Kanu Chatterjee’s Cardiology: An Illustrated Textbook includes the chapters on Cardiovascular Anatomy, Physiology, and Pharmacology; The History and Physical Examination; Cardiovascular Imaging Techniques; Cardiovascular Electrophysiology; Coronary Artery Disease; Pulmonary Vascular Disease; Peripheral Vascular Disease; Valvular Heart Disease; Heart Failure; Pericardial Disease; Congenital and Inherited Cardiovascular Disease; and their Prevention. Many of the chapters have been updated to include the significant advances since the publication of the previous edition. Chapter 1 to Chapter 52 available in Volume 1.